There are times when the outdoor spaces of your property have a number of slopes and this can make it very difficult to find leveled spaces to build outdoor structures such as patios, decks, outdoor kitchens, driveways, walkways etc. Before constructing any of these features, you would have to make sure that the designated spaces are excavated and leveled properly. But you also need to make sure that the exposed soil and rock from the dug-out slopes has the right amount of support to prevent soil erosion or mudslides. 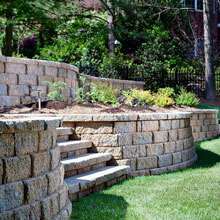 Retaining walls are features that can provide this support to the landscape. We at Rou Pavers are one of the leading companies in the hardscaping space and have created a distinct niche for ourselves in the industry. 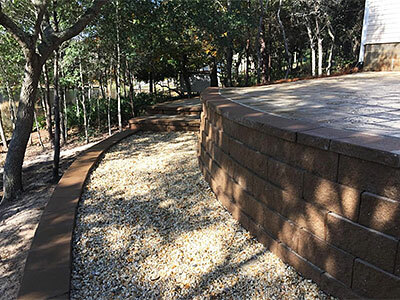 Our company has handled significant number of retaining wall projects for clients in and around Pensacola, Golf Breeze, Pace, and Milton. Our experts have designed and constructed impressive retaining walls on properties in Navarre, Navarre Beach, as well as Pensacola Beach. 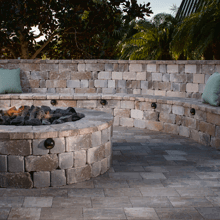 We are ICPI-certified installers and clients from across Fort Walton Beach, Baldwin County and the surrounding areas trust only us for all their hardscaping requirements. Retaining Wall Design (H2 Tag) Retaining walls are specially-engineered structures that are very different from standard boundary walls or garden walls and this is something we keep in view while building them. While we ensure that these features perform the function that they are designed for, we also focus on making them aesthetically-appealing. 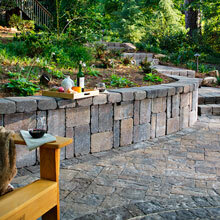 These walls are built using concrete masonry blocks that are modular in nature. 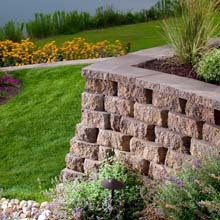 Today many companies manufacture retaining wall systems that emulate the look of natural stone. These blocks can be used to build walls of any height and length. 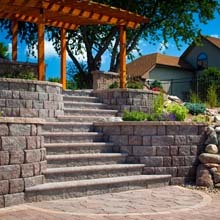 Our retaining wall designers also recognize the fact that clients always want something unique for their properties. And this is why we work very closely with them to understand what their specific requirements are. We can design simple concrete block walls and affix veneers on them. We can also build features that have in-built planter spaces or in-built seating. 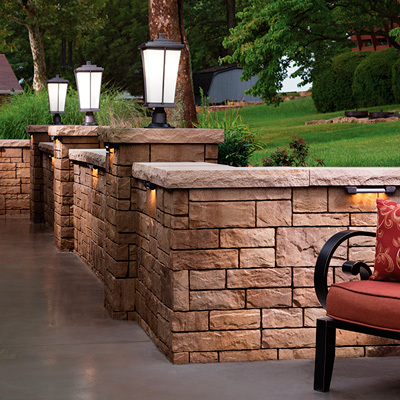 This makes it a dual-function feature that can be installed in different areas of your yard. 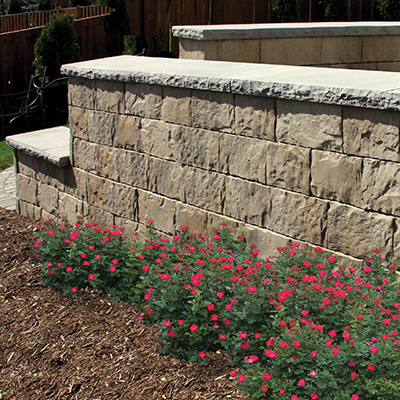 We use the best materials in the work and skilled and experienced retaining wall installers handle the job. This ensures you get features that will last for a very long time and provide your landscape the support and stability it needs. 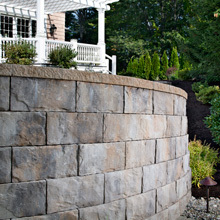 We can build retaining walls for your new landscape project or for your existing landscape in areas that are showing signs of soil erosion or are experiencing mudslides. This adds to the integrity of the landscaping and makes it more sustainable. 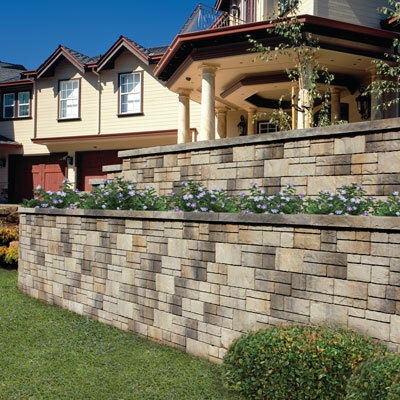 If you are looking for retaining wall contractors that will cater to your specific needs and give form to your ideas, we are the company to come to. 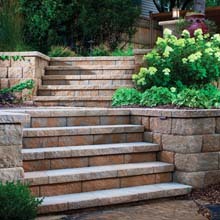 For any more information on our services and block wall cost, feel free to contact Rou Pavers at 850-791-5641. You can send us your project details via this Contact Us form or request a free estimate and one of our experts will get in touch with you shortly.